Is Your 2015-2018 Nissan with a CVT Transmission a Lemon? Do you own or lease a 2015-2018 Nissan and experience the same repeated problems with your CVT transmission? 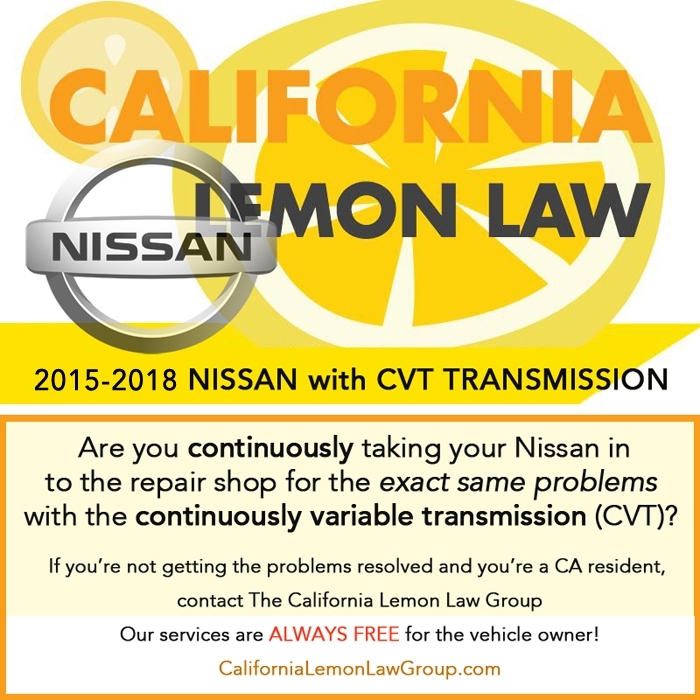 Your Nissan Sentra, Rogue, Versa, Versa Note, Altima, Murano or any Nissan Vehicle that has suffered from repeated CVT transmission failure may be a lemon. If you have taken your 2015 to 2018 Nissan CVT transmission into your Nissan dealership four or more times for transmission system repairs during the five year/60,000 mile warranty period, your Nissan may be a lemon. If you are having a problem with your Nissan other than the transmission system, we may still be able to assist you. If your vehicle has been taken to the Nissan dealership four or more times and Nissan has made repairs that have been covered by the original manufacturer’s warranty, and the problem with your vehicle substantially impairs your use, value, or safety, you may be entitled to relief under the California lemon law. What if the Dealer Offers You a Trade-in? Trading in your Nissan for another one is going to mean more money out of your pocket since your new car is worth considerably less than you actually paid for it. According to CarsDirect.com, a new car loses value almost immediately after you drive it off a dealership’s lot. As a general rule of thumb, a car will lose between 15% and 20% of its value each year. In its second year, a car will be worth 80% to 85% of its first year value, and its third year, a car will be worth 80% to 85% of its second-year value. Will the Auto Manufacturer Buy it Back Under the Lemon Law? The only entity that can truly buy a consumer’s car back from them under the California Lemon Law is the automobile manufacturer. A dealership may offer a “buyback” and will even tell the consumer that they are “buying the car back” under the lemon law, but the dealership generally does not actually do this. What the dealership is usually doing is a dealer assisted trade-in and with a trade-in, the consumer usually ends up rolling the debt owed on their vehicle into their new car purchase. This solution does not give the consumer all of the benefits of a repurchase under the California Lemon Law. The only amounts deducted from a lemon law refund are the mileage offset (usage fee) which is placed at the mileage of the very first repair, manufacturer rebates, negative equity rolled into the loan from a traded-in vehicle, and any non-manufacturer aftermarket items. Will the BBB Help Resolve the Problem? If a consumer does try to go through the Better Business Bureau’s Autoline Dispute Resolution Program, the consumer may think that they are getting a fair and unbiased neutral person to hear their case. Unfortunately, their “fair and unbiased mediators” are actually paid for by the automobile manufacturers. We have had clients come to us for assistance after an unfair result at the BBB’s hearing and we have gotten them a much better result. We have assisted many consumers who ended up with 2015 to 2018 Nissan vehicles equipped with CVT transmission systems where the vehicles have required transmission software updates, one or even two entire transmission system replacements, and yet the vehicles were never fully repaired. In all cases, regardless of how many trips to the dealership for a repair, there was and still is no permanent fix. As a word of caution, as tempting as it may be, a consumer should not post their grievances on a social media sites, or an auto forum chat room, or anywhere on the Internet. It is best to use those websites to read what others are posting to learn about the vehicle. We do not recommend posting anything that an automobile manufacturer’s attorney can find because they can try to use these posts against the consumer in a deposition, mediation, or even at trial. In addition, as unhappy as a consumer may be, we never recommend that a consumer complains to dealership personnel that they think the vehicle is a lemon because the dealership may be less likely to try to find a problem and repair it, thereby making our job more difficult later on. Please give us a call about your Nissan – We can help! Unlike many other Lemon Law Attorneys, we never charge our clients any fees!